For the LOVE…these cookies are unreal. My friend Michelle made them for a meeting I had with her one afternoon…I promptly (as in during the meeting) got the recipe and made them myself that very evening. The texture of the cookie is perfect – crispy-ish outside, soft inside. And the surprise peanut butter filling? Better than a peanut butter cup, I tell ya. Get ready. You’ll need to do a few (hundred) laps around the track in preparation for these cookies…you will not be able to stop eating them. Okay, I may be projecting here. Giving away a little too much information about myself. What’s new? In large bowl beat sugar, butter or margarine and ¼ cup peanut butter, until light and fluffy. Add vanilla and egg, beat. Stir in flour mixture until blended. Set aside. 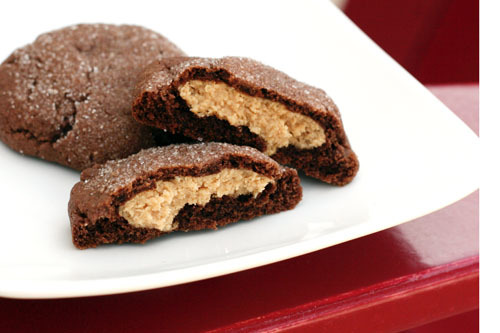 To make Filling: Combine confectioner’s sugar and ¾ cup peanut butter. Blend well. This post generated several questions – please click here to read the “appendix” for this recipe for a few more tips! Sold!! I’m making these tonight! Thanks for sharing! I’m making these tonight. I don’t care how tired I am or how much I neglect my family. Yep, I’m totally with ya and would be needing to do laps to work off those cookies. They look and sound amazing! Definitely bookmarking these!! You had me at, peanut butter/chocolate! I’ve seen these on other sites, but your beautiful pics have made it a done deal! Thanks for sharing! I have had a recipe very similar to this and almost died. I mean… surprise in the middle? YES PLEASE! LOVE the photography too! I’ve made these several times, always a hit! I saw your post and knew I had to make these cookies today. But I think I did something wrong, maybe my dough was too dry or something. When I flattened the cookies with the cup, the dough cracked all over to expose the PB filling. I’m sure they will still taste good, but I would appreciate any tips! I can already tell I’m going to LOVE this recipe, can’t wait to try it out!! I’m expecting you to bring these tuesday night! they kind of look like the rolo cookies, but with a little more work. My experience with flattening cookies with a sugared glass is that you need to flatten a few cookies to get enough grease on the glass to make the sugar stick. I’m training for a half marathon and plan to make these after my long run this Saturday so I can enjoy them guilt-free! They look YUM! Thanks! I cannot wait to make there and bring them to work… Can’t think of a better thing to bake for nurses week! I made these last night bc I just couldn’t resist! So good! I also had the same problem as Jenny D. My cookies split when I flattened them, but they are still really good, even the next day. I’ve always wanted to make something like this. What is the texture of the pb filling like? Is it too sweet? Yum! I plan on making and selling these for the Relay for Life next weekend! I figure since I will be doing several (hundred) laps around the track I can get away with it 😉 and so can everyone else! Thanks! 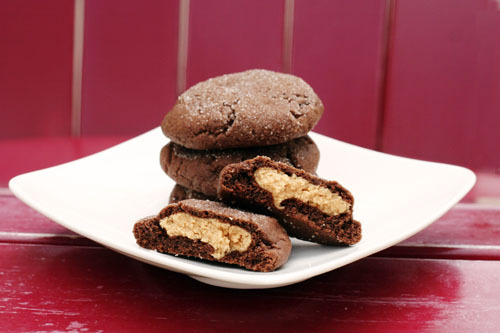 Oh for the love of all that’s chocolate and peanut butter…those look so stinking good! I’ll be making those for myself for Mothers Day thank you very much. these are posted also on mykitchencafe.com. i have made them and i could not stop eating them. you spray the bottom of your cup with pam. she gives the info on her site. My lovely housemate just spent her evening um… baaaakinggg to celebrate the end of finals, so I decided to surprise her with a little somethin somethin for all her hard word. These definitely did the trick! Peanut butter surprises to satisfy all sorts of bakers. -I used butter and peanut butter that were both unsalted, so I sprinkled a teeeeny bit of salt on top of the cookies when they came out of the oven — my newly observant housemate recognized the difference it made, even in her charming condition. She loved the contrast between sweet and salty. Impressive, no? Makes a WORLD of a difference. All things said, great recipe. Yum! I found these at King Arthur Flour’s Website http://www.kingarthurflour.com/recipes/magic-in-the-middles-recipe, don’t know who gets the credit for them originally, but they are a thing of beauty. Love your website! My dough was really dry too. I kept reading the recipe thinking I did something wrong! Also, 1″ balls seemed too big to wrap the chocolate dough around, the dough kept cracking and it was hard to completely wrap the peanut butter up. I wrote an “appendix” for this recipe based on all your questions and comments. thank you so much for all your comments!! Just made these – a big hit with my husband. Thanks. I made these over the weekend and they turned out great! I followed the recipe word for word and it was right on. Thanks for sharing such a yummy treat…peanut butter and chocolate…my favorite combination! These cookies are AMAZING!! I made them last week and they did not last long with company over. My husband is requesting them again next week for his birthday instead of a cake!! I only use natural peanut butter so can I use that or will it separate too much in cooking? hi melissa! sorry I missed your comment until now! I have never used natural peanut butter so I’m not sure what would happen. but I think it would be worth giving it a try! just mix it up really well! It started out to be a great recipe until my daughter and I figured it was a crumbly mess. Then, the peanut butter was too soft so it couldn’t be formed as balls. Major clusterf#$%. There’s peanut butter everywhere in my kitchen, NOT ENOUGH LIQUID!!!! This recipe ruined our day. Thanks a lot, Jane. Hi Meringuette! I’m sorry that you had trouble. I hope that you saw the link to the “appendix” for this recipe https://thisweekfordinner.com/2010/05/17/magic-peanut-butter-middles-appendix/ – it is in the comments and listed right below the recipe. Also, this recipe is not mine originally – I found it at many different sources, including AllRecipes.com, where it has a 4.5 star rating and almost 600 reviews. I have made it many times and they always come out. The link I shared for the “appendix” goes into a LOT of detail about how to form the cookies and work with the dough. The cookies can be tricky to put together, but they are worth the work! Also, if your peanut butter is too soft (maybe the weather would impact this), you could try adding a bit of powdered sugar. But if you can get the recipe to work with the ratios given it really does comes out wonderfully. Hope that is helpful. Thanks!